Augustus Edwin John (1878-1961), Painter. Artist associated with 33 portraits, Sitter in 103 portraits. Lady Ottoline Morrell, the chatelaine of Garsington Manor outside Oxford, was a ferocious socialite, friend and lover of artists and writers, including Augustus John, whom she first met in 1906 and with whom she had a brief affair in 1908. He began this portrait in 1918. When it was exhibited in 1920, most people were critical of it. The Star called it a 'grotesque travesty of artistocratic, almost imbecile hauteur'. The Manchester Guardian, however, recognized its merits: '... an ideal portrait in the Johnian sense in the way that it makes life more exciting and fantastic and unlikely'. Lady Otttoline herself liked it and hung it over the mantelpiece in the drawing room of her London house. 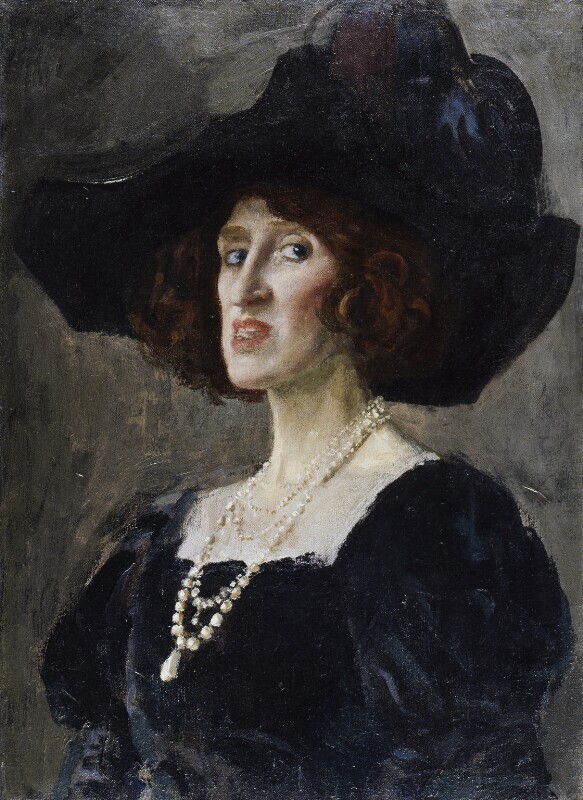 It is well described by Michael Holroyd in his biography of Augustus John: 'Her head, under its flamboyant topsail of a hat, is held at a proud angle and she wears, like rigging, several strings of pearls (painted with the aid of tooth powder) above a bottle-green velvet dress. Her eyes are rolled sideways in their sockets like those of a runaway horse and her mouth bared soundlessly'.